Delicious cakes fresh-from-the-oven don't have to be difficult. Really. Back to school also means back to fund-raisers, classroom parties, bake sales, and potlucks - not to mention volunteer, car-pool, and play-date thank yous. If ever there were a time to have a few simple great-tasting cakes in your kitchen arsenal, this is it. These are three of my favorites. They are quick and easy to throw together, sturdy enough to withstand transport across town, and easy to dress up with some sugared sliced peaches or berries and whipped cream, or even easier with a dusting of confectioners' sugar (my usual route). The chances are good that you'll have the ingredients for at least one of them on hand without a trip to the store - the chocolate-mayonnaise cake doesn't even require eggs. If you have time, you'll get the best results if you bring refrigerated ingredients to room temperature before mixing the batter. Set the oven rack in the middle position and heat the oven to 350 degrees. Spray an 8-inch or 9-inch square baking pan with nonstick baking spray and set aside. In a medium bowl, whisk the flour, baking soda, and salt. In a large bowl, whisk the cocoa and boiling water until smooth. Allow to cool for 2 minutes. Add the mayonnaise, vanilla, and sugar and whisk to blend. Add the mayonnaise mixture to the flour mixture and stir to incorporate just until smooth (do not overmix). With a flexible spatula, scrape the batter into the baking pan, smooth the top, and bake just until a toothpick inserted into the cake comes out clean and the edges of the cake begin to pull away from the pan, about 40 minutes (do not overbake). Place the cake on a wire rack, cool to room temperature, cut into squares, dust with confectioners' sugar, if desired, and serve. Master baker and part-time Paris resident Dorie Greenspan introduced me to this cake, which is fragrant and tangy, with a rustic texture. My recipe is adapted from her 2006 book Baking: From My Home to Yours. If you're serving this to adults instead of kids, consider adding 1/4 cup amber or dark rum along with the liquid ingredients. Set the oven rack in the middle position and heat the oven to 350 degrees. Spray an 8 1/2- by-4 1/2-inch loaf pan with nonstick baking spray and set aside. In a large bowl, whisk the flour, baking powder, and salt. In a medium nonreactive bowl, stir the sugar and zest together until sugar is moist and fragrant. Add the yogurt, eggs, vanilla, and oil and whisk vigorously to blend completely. Add the flour mixture and stir to incorporate just until smooth (do not overmix). With a flexible spatula, scrape the batter into the loaf pan, smooth the top, and bake until golden brown, the edges of the cake are just pulling away from the pan, and a toothpick inserted near the center comes out clean, about 1 hour (do not overbake). Place the cake on a wire rack and cool for about 10 minutes. Run a blunt knife between the cake and the pan sides, turn the cake out, place it right side up on the rack, cool to room temperature, dust with confectioners' sugar, if desired, slice, and serve. Set the oven rack in the middle position and heat the oven to 350 degrees. 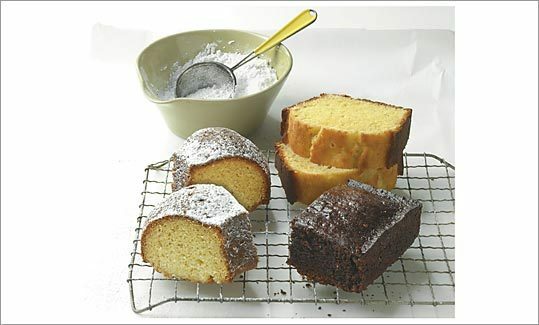 Spray a 10-inch Bundt pan with nonstick baking spray and set aside. In a large bowl, whisk the flour, cardamom, baking soda, and salt and set aside. With a hand-held or standing mixer, cream the butter and sugar at medium-high speed until pale and fluffy, about 3 minutes, then use a spatula to scrape down the sides of the bowl. Add the eggs one at a time, beating well after each addition. Add the vanilla, beat well, and scrape the bowl again. Reduce mixer speed to low and add about a third of the flour mixture, followed by 1/2 cup of sour cream, mixing after each addition until just incorporated, about 5 seconds. Repeat, using half of the remaining flour mixture and the remaining 1/2 cup of sour cream. Scrape down the sides of the bowl again and add the remaining flour mixture; increase mixer speed to medium-low and mix until batter is thoroughly combined, about 15 seconds. Use the spatula to scrape the batter into the pan and smooth the top. Bake until golden brown, the edges of the cake are just pulling away from the pan, and a toothpick inserted into the cake comes out clean, about 40 minutes (do not overbake). Place the cake on a wire rack and cool for about 10 minutes; turn the cake out, place it right side up onto the rack, cool to room temperature, dust with confectioners' sugar, if desired, slice, and serve.